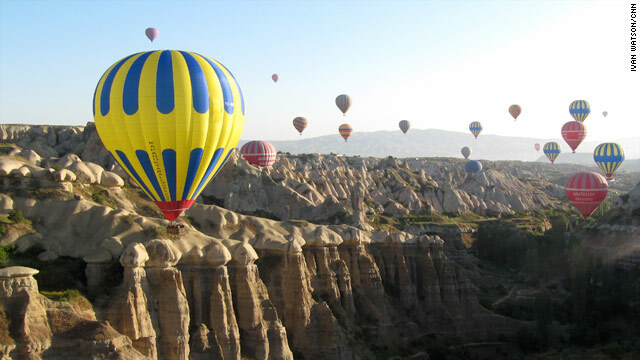 Hot air balloons float over the otherworldly landscape of Cappadocia, Turkey. The lava-rock moonscapes, fairy chimneys, cave dwellings and ancient Christian chapels of Turkey's Cappadocia region have long been a fascinating destination for backpackers and tourists. Now, an Australian artist named Andrew Rodgers has unveiled a man-made addition to the region's remarkable landscape: a statue park called "Rhythms of Life." Best seen from the vantage point of a hot-air balloon, the park consists of enormous sketches made of stone walls built in the shape of a horse, an ancient grinding mill and an ancient Hittite symbol. More then 1,000 locals worked on the ambitious project. Ivan Watson reports from Turkey's interior. Like Soho in New York or Montmartre in Paris, Istanbul's Cihangir neighborhood has become a cultural hub -- a draw for artists, writers, and intellectuals. Rima speaks to Turkish author Buket Uzuner to find out more about this up-and-coming neighborhood. Festival Mawazine is a celebration of world music hosted every year in Rabat, Morocco. Nearly 1,500 concerts, street performances and art exhibitions attract millions of spectators. Elton John, Carlos Santana, Sting and many other European, African and North American music stars lit up this year's festival. The theme of this year's event was "universalism, tolerance, openness to others," promoted through the diversity of music. As Istanbul celebrated its eighth LGBT Pride events, Inside the Middle East was there for a unique award ceremony: the "Genetically Modified Tomato Awards," where gay-rights activists name politicians, media personalities, educational institutions and others who have made public homophobic remarks or actions over the year. We speak to an activist about the challenges facing Turkey's gay-rights movement. It's not what you would expect to see from eight Palestinian women in Ramallah on a Saturday afternoon: smoke billowing from underneath their cars, wheels spinning wildly, and screeching tires marking a race track with black marks. These eight women are breaking every stereotype in the male-dominated world of car racing. Paula Hancocks meets 21-year-old Noor, who has wanted to be a race driver since she was 10, and is competing in her third race of the season.